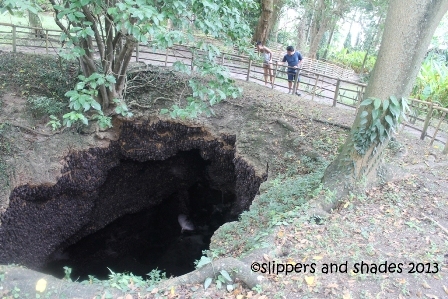 If it wasn’t for this tour, we would not be able to discover Monfort Bat Cave which houses an estimated 1.8 million bats. 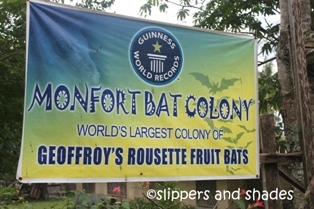 It was recognized by the Guiness World of Records on February 2010 as the world’s largest colony of Old World fruit bats known as Geoffroy’s Rousette Fruit Bats. Amazing! Our visit to the cave was something peculiar because we just got off from swimming activities for the past several hours. We paid for the entrance fee (P100/head) and had a leisure walk on the neat pathway going to the Exhibit Area. 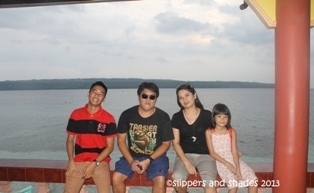 The view of Davao Gulf and the tall palm trees were indeed a sight to behold. We were briefed about the bats and later accompanied by a 12-year old little girl named Amanda as our guide. She started her cue as soon as we hit the pathway to the first of five cave openings surrounded by bamboo railings. 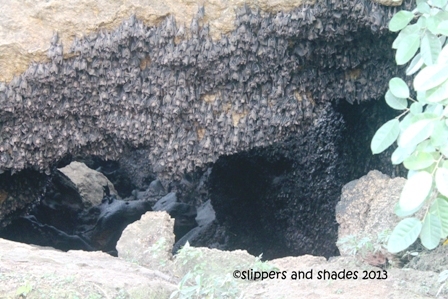 We were amazed to see immense number of bats hanging upside down on the cave wall. They were very close together, some were flying, some were clinging almost to the ground. It was almost five pm and their shrieking sound got so louder and louder. The strong smell of their wastes known as “guano” exuded the area. It is said to be used by local farmers as natural fertilizer. 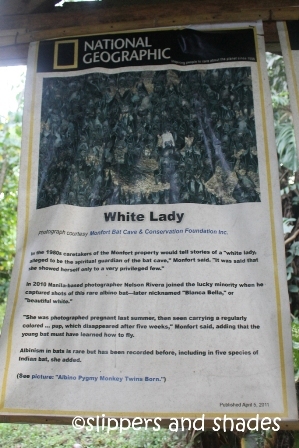 We were lucky that we saw the White Lady bat, the only white among the millions of hanging bats. We were told that bats were forming a huge whirlwind formation at night time and will fly in group across the region to pollinate fruits. And they will return before dawn. That would be so exciting to see but the sanctuary is closed at 6 pm so we have no opportunity to witness that spectacular phenomenon. When we went back to the Exhibit Hall we got to know more about the bats by reading all the articles especially those of National Geographic Magazine attached on the wall. We were given a small pamphlet with informative facts about bats. And here it goes. 1) Bats are found through out the world except in the Artic and Antartic. 2) Some bats live up to 30 years! 3) Of over 1116 kinds of bats globally, 123 come from Southeast Asia. 4) Of over 450 mammal species in S. Asia, more than 25% are bats! 5) The smallest bat in the world can fit into a matchbox – bumble bee bat. 6) Bats are not pests they control pests by eating insects. 8) Bats are not a bad omen. They are considered lucky in some countries. 10) Mother Bats have babies called “pups” once a year. 11) Bat homes are called “roosts” and they live in giant joint families. 12) Bats are comfortable hanging upside down. 13) Insect bats use ultrasound to find food and avoid obstacles. 14) Insect bats have less vision due to life in caves but fruit bats can see. 15) Bats are like cats in washing daily and being clean. 16) Also like cats, males bats mark their territory. 17) Bats are the only mammals that fly. Flying squirrels glide. 18) Bats have been in this world for over 50 million years. Now you know more about bats. We were the last visitors to come out from the sanctuary. We were so delighted to Amanda for being so informative. Such a small bright girl. We gave her a tip as a reward for answering all our queries. We were thankful to the current owner, Norma Comfort in her advocacy of preserving these fruit bats in this island. By the help of the residents and the local government, they were able to protect the colony which has valuable contribution to the ecological balance and to the mankind as well. Take a ferry boat from Sasa Wharf to Bakak Wharf. You may choose to ride a habal-habal (negotiate for the fare) or the Inland Express non-aircon bus and tell the driver to drop you to the entry point of Monfort Bat Cave. 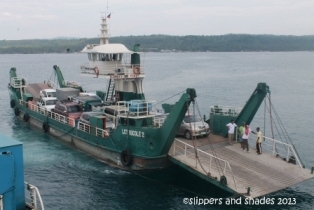 The road is accessible by car so it is better if you bring your own and take the ferry service at Sasa Wharf for a minimal fee of P300 for the vehicle and P10/head for the passenger. 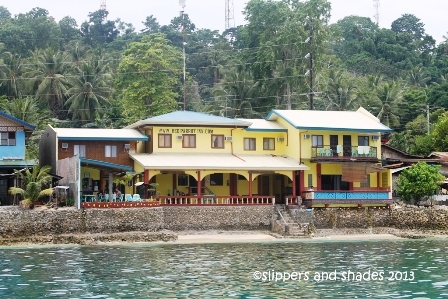 Setting foot at Samal Island or the Island Garden City of Samal in the province of Davao del Norte is the most exciting part in our Davao City tour. The island which has been said the largest resort city in the Philippines boasts of the famous Pearl Farm Beach Resort, pristine white sand, rich marine life, waterfalls and other exciting tourist spots that will surely make your stay so memorable. The entry points to reach the island are Sta. Ana Wharf (direct to Kaputian and Talicud Island) and Sasa Wharf (direct to Bakak Wharf) via ferry boat ride. From Drifters British Pub and Apartelle in Lanang , we were fetched by Barney’s brother-in-law through their van and head off to Sasa Wharf. Upon arriving at the wharf, we queued for few minutes paying for the P10/passenger ferry ride and P300 for our four-wheel vehicle. We went aboard the Roro (Roll-on Roll-off) ferry and got so excited hopping out from the van and made our way to the top. It was a nine-minute ride embracing the stillness of the calm blue sea and watching below the people from all walks of life. Near Bakak Wharf was Nest Convenience Store to where we bought toiletries, drinks and snacks. Our van ride was so fast, blame it to the well-paved road.hahaha! Everyone was drawn into fascination watching picturesque countryside view. The journey took us almost one hour reaching Captain Hook’s Red Parrot Inn. It was located in Kaputian, the farthest tip of the island. The Whole House was reserved exclusively for us. It has three rooms, kitchen, dining area, living room, two comfort rooms, a backdoor with direct access to the beach and wi-fi facility. We were assigned to a room with two double-decks. 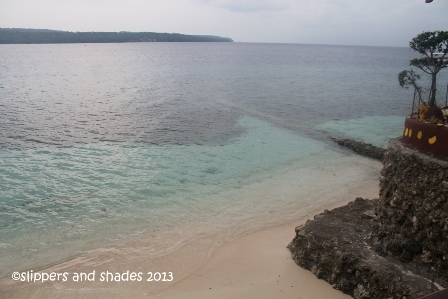 From the window, a vast expanse of blue water and Talicud Island could be feasted by the eyes. What a wonder! As soon as we put our bags on bed, my little girl hastily enjoined me to swim. From the back door we slid into the veranda where my hubby, my son and our buddies were having a busy conversation. From where we stood, I was so overwhelmed to see a complete sea view, in fact a stunning sea view. The beach resort had short and small strip of very fine creamy white sand. It was shallow, hence, so safe for my little girl. The water was clear and clean. No wonder we had a good time soaking on the water till the boys joined us at night time. We still wanted to swim after a hearty dinner but unfortunately, it rained. We stayed on the veranda to enjoy the night time solitude. It was so cool and so serene. Its calming effect was so soothing. This was indeed a fulfilling vacation and I just love to go back in this beautiful island. The boys had their social activity on the veranda except my son who was busy playing with his Samsung tab. The kids were also busy playing with their toys. I’m not used to watching TV, but I was invited by the chic living room to sit back, relax and watch tv. No laptop, no cellphone. Wow! It was almost twelve midnight when we went to bed.